BigCityLib Strikes Back: Signs Of The Apocalypse Appear In T.O. there is no need to move to Alberta, as a) I think the height of the plague is now over, anyway, and b)Edmonton and Calgary also have lots of bedbugs. 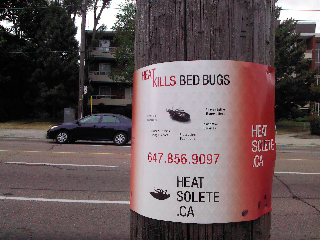 In any case, having suffered through bedbugs in Vancouver, they no longer frighten me that much. Just have a bed on four legs and no other part of the bed touching the floor with little dishes to trap the bedbugs, and a bedbug proof mattress cover, and you can nearly always detect the buggers on time. Also, I think it helps to have lots of other little insects in your house. My current house in Korea has lots of little centipedes running about, so any bedbugs we might have brought back with us from Vancouver (and I think we brought one or two, one or two more during a trip to Germany, as I know the hotel room we were in was buggy) were eaten in pretty short order by the centipedes.